Tonight's Democratic Presidential Debate offered up many body language teaching moments. What follows is an examination of but one of these - very commonly seen yet often misinterpreted. In this video segment, Anderson Cooper asked the five candidates, "Franklin Delano Roosevelt once said, 'I ask you to judge me by the enemies I have made'. You've all made a few people upset over your political careers - which enemy are you most proud of?" 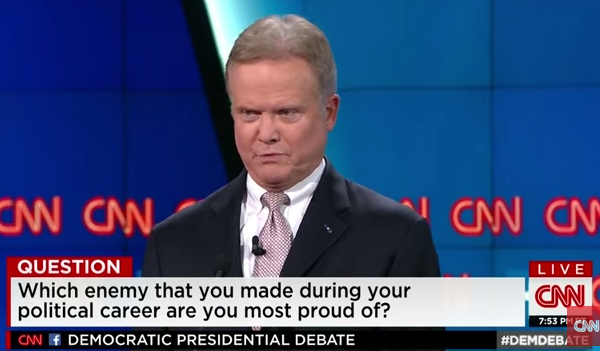 When it was Jim Webb's turn, the former Virginia Senator answered, "I'd have to say the enemy soldier that threw the grenade that wounded me - but he's not around right now to - talk to." (Note Jim Webb is a recipient of the Navy Cross for actions of bravery in the Vietnam War which he, in part, alludes to here). During his answer, Senator Webb repeatedly elevates up on his toes (please view the video to fully appreciate this dynamic signal). This nonverbal sign tells us the former Secretary of the Navy is quite proud of his response. He feels he has slam-dunked this answer. Elevating up on one's toes can be thought of as a subconsciously generated "energy-bleeder" - wherein the psyche is attempting to release adrenaline (and its effects) and although it has a component of "good nervousness" associated with it - this body language tell is primarily indicative of joy, optimism, excitement and pride.